We kicked off the weekend with design exercises to get creative juices flowing and then had Kol Peterson of Accessory Dwelling Strategies (and one of the creators of AccessoryDwellings.org) join us as a guest speaker to share information about regulations so our students could learn about the constraints specific to their situation. 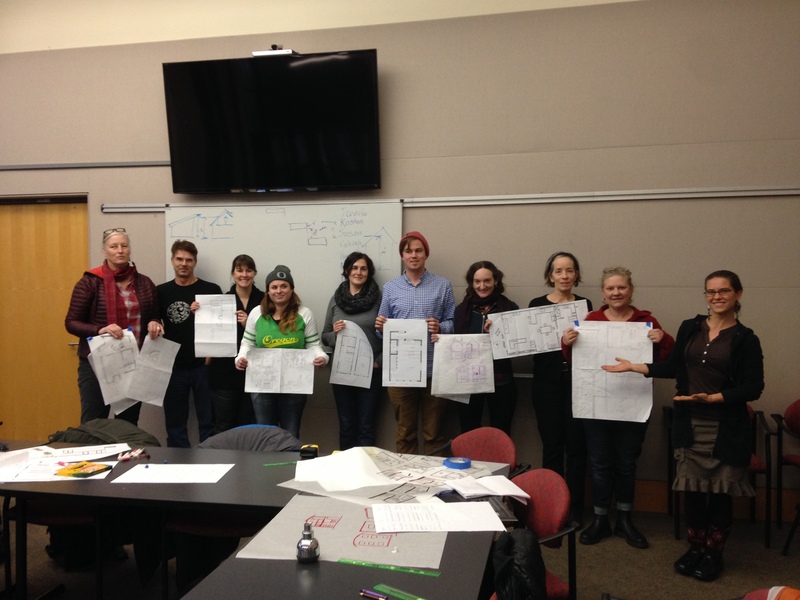 We designed an ADU together at life-size and practiced capturing it on the page. Then each of the students worked through layout considerations for their own designs. We were lucky enough to use the Water Pollution Control Center for the course, which has views of the Willamette and great natural daylight. Since it poured (and periodically snowed!) throughout the weekend it was a lovely space for design work and it gave us room to spread out as people played with modeling and design materials. On Sunday our designs went into the third dimension as we explored sections and elevations (and discovered that some of us are going to have to rethink our stairs!) We had several other special guests join us who have real-life experience designing, building, and living in ADUs. (We’ll keep secret who they were so you’ll be surprised when you take the course yourself, but let’s just say that all of our guests have been featured on the AccessoryDwellings.org website!) By the end of the second day our students presented their big ideas to the group to receive feedback which they can use as they continue noodling over their ADU designs. If you’re interested in joining us for the next round of ADU Design, mark your calendar for May 6-7 and stay tuned for registration information! Hi Tim, I’d love to do an on-site consultation with you to explore the considerations of your creating an ADU for your specific situation. You can get the process started by signing up on my website: http://www.nichedesignbuild.com/consultations/on-site. Then we can compare calendars and find a time that will work for us. You can also find a list of Designers and Builders right here on the AccessoryDwellings.org website: https://accessorydwellings.org/adu-professionals/. This entry was posted on February 7, 2017 by linamenard in Design & Build, Events, Floor Plan and tagged ADU Design, ADU design class, ADU Design course, Kol Peterson, Lina Menard, PCC, Portland Community College, weekend ADU design class, weekend ADU design course.